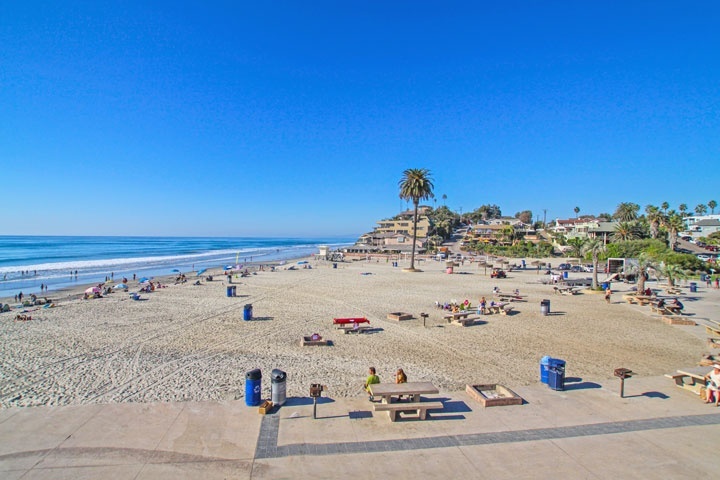 Encinitas Real Estate is considered to be amongst the most expensive beach town in San Diego County. Encinitas is located just north of Solana Beach and Cardiff by the Sea and south of Carlsbad. Encinitas features over 100 different neighborhoods to choose from that can feature historic homes in the Old Encinitas area to newer construction communities like Fiore and Seaside Ridge. The area near and the beach and the northern section of Encinitas is commonly referred to as the Leucadia area. This is an eclectic area filled with funky older homes combined with stunning oceanfront estate homes. The Leucadia area is considered one of the best locations to live by the beach in Encinitas. We have broken down the different areas of Encinitas here below. For questions regarding any of these communities listed below please contact us at 1-888-990-7111 today. Leucadia 130 Diana Street Apt. There are also many gated community homes in Encinitas that can offer large estate homes and ocean views. Gated communities like Pacific Crest and Halcyon Estates will be located near the beach while other high end gated neighborhoods like Copper Crest Estates, Wildflower Estates, Knightsbridge and Double LL Ranch communities will be located in the Olivenhain area of Encinitas. Olivenhain is a semi-rural area of Encinitas with equestrian zoned horse properties and large estate homes located on over-sized lots. Many of the homes can be featured on over an acre of land and offer many horse trails in the area. The Olivenhain community neighbors the Rancho Santa Fe city lines and is considered one of the most upscale areas of Encinitas. There are also many neighborhoods located around the Encinitas Golf Course that offer beautiful Spanish style newer construction homes. This is also a great location that can offer wonderful panoramic views of the Pacific Ocean. For those looking for a condo then Encinitas has a lot of great options. Communities like Country View incorporate condo living with neighborhood golf courses while beachfront condos located at Sandpiper Pointe offer great ocean and white water views. The city of Encinitas is a great place to live filled with sophistication and style. "A Pacific Pines Racquet Club condo in Encinitas, California has just sold by Beach Cities Real Estate agent Dan Benjamin who represented the buyer. nbsp;1750 S El Camino Real, Encinitas closed escr... "
Based on information from California Regional Multiple Listing Service, Inc. as of April 20th, 2019 at 3:44am PDT. This information is for your personal, non-commercial use and may not be used for any purpose other than to identify prospective properties you may be interested in purchasing. Display of MLS data is usually deemed reliable but is NOT guaranteed accurate by the MLS. Buyers are responsible for verifying the accuracy of all information and should investigate the data themselves or retain appropriate professionals. Information from sources other than the Listing Agent may have been included in the MLS data. Unless otherwise specified in writing, Broker/Agent has not and will not verify any information obtained from other sources. The Broker/Agent providing the information contained herein may or may not have been the Listing and/or Selling Agent.